The best long-term solution for the disposal of the UK's nuclear waste should be to bury it deep in the ground, an advisory group has said. The Committee on Radioactive Waste Management (CoRWM) has released draft recommendations after three years of investigation and consultation. It says the time taken to develop deep facilities means that robust interim storage measures are also needed. CoRWM was not asked to identify places in the UK where disposal should occur. This contentious issue will be addressed in a separate process initiated by the government - although CoRWM believes this process can only succeed if host communities are identified on the basis of a "willingness to participate" and they are fully and openly involved in key decisions. "For 50 years, the UK has been creating radioactive waste, without any clear idea of what to do with it. Whether we like it or not, waste exists and we have to deal with it," said CoRWM chairman, Gordon MacKerron. "The committee has confidence that geological disposal is the best end point for managing our waste. It is the option that should perform best in terms of security, and protecting the public and the environment." 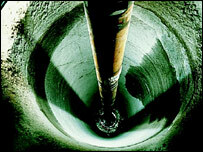 The final disposal facility, or facilities, would be located several hundred metres underground. The waste would be encased in tough materials and would use the surrounding rock as a barrier to prevent radioactive leakage into the environment. Around one-third of the land in the UK is thought to be geologically suitable for this purpose. The committee says such stores could take several decades to develop. This may happen because technical problems arise in their construction, or simply because public agreement on the best locations is impossible to achieve. CoRWM says this means a robust interim storage strategy is absolutely essential. These "temporary" storage facilities must be safe and secure, particularly against terrorist attacks; and they should be built with the prospect of being used for many decades. CoRWM says that from its discussions with stakeholders and the public, the interim strategy should also aim to minimise the re-packaging and unnecessary transport of wastes. The UK's radioactive inventory from the current nuclear programme is expected to include 470,000 cubic metres of materials. 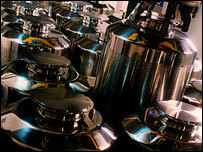 This includes the highly active waste from fuel re-processing and the irradiated remains of decommissioned reactors (it also includes the uranium and plutonium in spent fuel rods, although these are not technically classed as waste at the moment because the materials could be re-cycled into more nuclear fuel). CoRWM's extensive investigation of the issues has dismissed other disposal options, such as putting the waste on the ocean floor or flying it into the Sun. 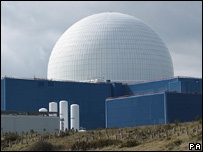 The committee also stressed that it had no view on the current debate about whether Britain should begin building new nuclear power stations. Dr Richard Shaw, principal scientific officer at the British Geological Survey, commented: "Deep geological disposal is the preferred method for the long-term management and eventual disposal of high activity and long-lived radioactive waste adopted by many countries, including Finland and Sweden, and offers a safe option for the management of these wastes in the UK, now and into the future. "The majority of earth scientists believe that geological disposal in a well-chosen geological environment is the right means of dealing with these wastes." However, Jean McSorley, senior nuclear campaigner at Greenpeace UK, said: "We believe there should be a policy of long-term storage above ground, because we know that when they put this stuff below ground, it leaks. "CoRWM itself has tried to do the best job it can but it has become enmeshed in the debate about new reactors even though it didn't want to. I guess the strongest criticism we have of CoRWM is that if nuclear waste is such a big issue [CoRWM] has to speak out against new reactors." Sir David Wallace, vice-president of the Royal Society, the UK's academy of science, said: "We now need to see the establishment of a body, independent of both the nuclear energy industry and of the government, to take forward the development and implementation of an integrated strategy. "This body will need to include a strong representation from the scientific community, as well as wider public interests. Among its tasks should be to determine the criteria through which sites for deep geological disposal will be selected." CoRWM will deliver its final report to the government in July. How would you like the UK's electricity to be generated by 2020? Where to bury nuclear waste? Influence the debate. Advice and contacts to get you started.